Designed specially for the small rider, this Krypton synthetic Western saddle features an unbeatable combination of performance, balance, and precision. 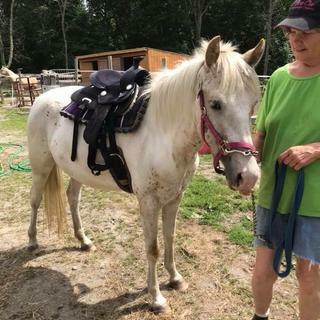 It’s a great choice for the young rider just starting out, trail riding, and riding lessons. I ordered an 11 inch brown saddle for my 4 year old son and his new 36" pony. It is such a nice saddle and looks better in person than the photos. Really lightweight and great quality. I was surprised how nice the brown leather looks on it too. Its the perfect size with room for my son to grown with. I think anything smaller than 11 in would be too small. Fits perfect with the 23 in saddle pad I got too. Pad doesn't hide under it. 6.5 in gullet is perfect and I love it can be used on a bigger horse too if need be. Came with a cute pony cinch and rear cinch. Great size and weight for our mini pony. Great saddle for great price! I bought this for a mini horse hoping it wouldn’t be too big. It was absolutely perfect! It was delivered quickly. Granddaughter loves it! You can’t get a better deal! Comes with girth and rear cinch so it keeps the back of the saddle down. Highly recommend this saddle! Sherman is a very tiny petite mini. Approx. 28"
Sherman modeling his new saddle. This is a 10". Very light weight and everything is adjustable. LOVE IT!!!!!!! Perfect for my 3 year old and really a nice saddle!! I would definitely recommend this saddle, great quality and construction, no extras, just plain and simple for my six year old to start learning to tack up her pony. Love it.Only glitch was the girth. Had to use regular saddle girth to fit around belly! 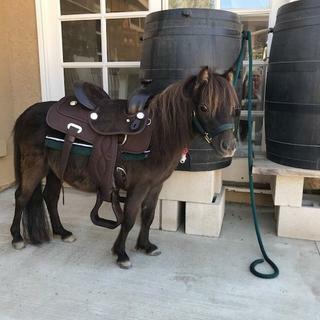 We have a miniature horse and have had a terrible time finding the appropriate saddle this saddle was absolutely perfect in every way for our miniature horse if you have a mini and you need a saddle for a young one this one is great! I purchased this saddle for my daughters ages 2 & 3. It looks great is very light and fits our 12 hands hackney pony perfectly. Seems to be well maid. I only lead them around on him right now but I'm looking forward to them using it for several years. I looked at quite a few and read a bunch of reviews. This one lives up to the positive reviews. I would definitely not buy anything smaller than a 10 inch seat. I am very pleased with my new saddle, looks great and price was reasonable. This is a wonderful product for the price. It really is nice quality. I just wanted a simple saddle so my kids could ride around the yard. They are still very small but this saddle is perfect for the beginner western rider & big enough for them to grow into. Nice seat & horn also for them to grab onto. This is a great little saddle for the price!! This saddle is as well made as a 17" Big Horn synthetic saddle that I have had for 15 years. I am very pleased with the durabilty, looks, and comfort for pony and rider. Definitely recommended to anyone looking for a good synthetic saddle for their kids. I bought this saddle for my mini horse who is a 34". He is not very long and this saddle fits very well on him. I haven't found a saddle for the mini that doesn't go up a little in the back once cinched, but this one works the best that I found. I recommend this saddle for sure. It's short enough for most mini's too since it's only 17.5 inches long from front to back. Nice pony saddle for the price. For the price the quality is what I would have expected. It is well made, My biggest gripe in the synthetic material used on fenders, etc, was stiffer than I would like and in places has tendency to ripple. The durability I don't know and over time that will depend on grandkids. Fits Shetland pony fine. it seemed to be a decent product for the price we will see when it arrives. Read the review on the saddle and I am hoping this will work for a 4 year old and our mini horse! Having lots of trouble finding a saddle but this one had great reviews. The pad looks good and hopefully will work out great too since it doesn't appear to be too thick and we have a non-slid pad to go underneath the pad. The price was very good compared to other sellers. How do I determine if we need a 10 or 11? I know what size saddle I need? BEST ANSWER: I have a small Shetland pony and I purchased a 10" which fit him fine. Small children are going to ride on this saddle. We bought this saddle for our 3 year old granddaughter and she is now 5 and has outgrown it, but we will use it for our other grand children. Does this saddle come with a cinch? BEST ANSWER: Yes, it came with a cinch. I am satisfied with my purchase. How long are the stirrups? BEST ANSWER: I could get them as short as 12in but they weren't really functional and weren't flat. They went as long as 20 in. I measured from where the stirrup is attached under the skirt to the place on the stirrup where the foot would rest. Long. My five year old grandson is tall for his age and I had to punch a hole to 2 inches from the last hole make the stirrups short enough. They are longer than I had expected & do not accommodate 7 year olds. Possibly a 10 year old? It's a great saddle for the money, though! Will this saddle fit a 13 hand POA? BEST ANSWER: I feel the saddle will work well for the larger ponies. We bought for mini horse and was plenty long and wide. Put it on 16 hand older ranch horse. It looked silly but fit better. I have 3 of these saddles and use them on my Ponies that do a sweep and I am very happy with them it is my go to saddle so I would think it would fit fine. Yes, we have a 13.2 hand Baskir Curly mare that this saddle fits, we use a standard cinch, you probably will need a back cinch extender though, we did. We have used this saddle on all size of horses and had no problems. Need a kids saddle that fits a 15.2 hand horse?? BEST ANSWER: We bought this for our 11 hand pony and it fits perfectly for our 4 year old granddaughter. I guess it depends on the size of your kids? I guess it depends on width of horse. My pony is kinda wide and it seems fine. You might need longer straps and bigger cinch. Weâ€™ve used this saddle on about every size of pony and horse and have not had any issues. 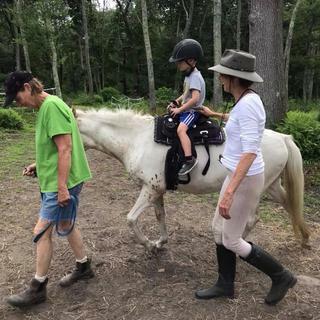 My horses are 14 hands (56 inches) and I would like a saddle that my grandkids can use on my horses which are large pony sized. Would this saddle work on a horse this size? BEST ANSWER: Yes, this saddle should work on bigger horses, we put it on our 13.3 hand Curly mare for our grandkids, you'll have to use a horse size cinch and back cinch extenders though....have fun !! This saddle has a 6" gullet and an 18"x21.5" skirt. If you are unsure if this saddle will fit your horse we encourage you to consult a local saddle fitter or trainer. I don't think so we use it on a mini and my grandson who is six is already to big for it , my three year old grandson fits it. Is the 10 or 11 the seat size? BEST ANSWER: I am wondering why the seller Stateline Tack cannot answer this question... They should know... it is part of the item description. It is not always a matter of can't answer. Sometimes staff might choose to allow the public to answer these questions for various reasons. Yes. In inches. The 10 in fits my two year old and might for awhile. If its for an older child, I'd go with the bigger size. I see on the reviews that many people order this saddle for minis. Does the 6.5" gullet really fit them well? It's not too big? I is too big for our mini for a really good fit. Fits okay for the amount of time she is ridden and the little ones are so light weight. How do you know weather to go with 10 or 11 for saddle? My daughter is 3. BEST ANSWER: It is always the best to consult a person with experiencing fitting saddles if you are unsure what size saddle to purchase. With that said, the only major difference in these two saddles IS the seat size. And considering that children will only grow, a slightly larger seat may allow a smaller child to use the saddle longer. My 4year old weighs 37 lbs and I bought the 11inch and the seat fits well although the strirrups are a little long. The saddle is a good buy for your money I think! BEST ANSWER: I think you can choose a 10 or 12 inch seat. They are size 10" and 11" on the website. What are the stir up lengths on this saddle? BEST ANSWER: We use UPS. Does it come with the straps? BEST ANSWER: I comes with the billet strap and the off billet strap. What is the best size for horse with high Withers and narrow shoulders? BEST ANSWER: It is always best to consult with a local person experienced with saddle fitting when unsure what is the best fit for your horse. Is there a way to shorten the stirrups or can I order a shorter set? The ones that came with the saddle are to long for my daughter. BEST ANSWER: Not that I am aware of. I have them in the highest notch and still too long for my granddaughter. And she is tall for her age. can i get this with a 4 to 5" gullet? BEST ANSWER: I'm sorry, this saddle is only manufactured with a 6.5" gullet.